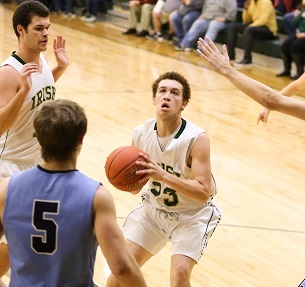 The West Virginia Sports Writers Association has announced the members of the Class A All-State boys’ basketball team for the 2018-19 season. And a foursome of local players was recognized by the organization. Notre Dame’s Gabe Zummo and Jaidyn West were named to the honor squads. South Harrison also had a pair of players recognized in Caleb Jenkins and Brent Barnette. 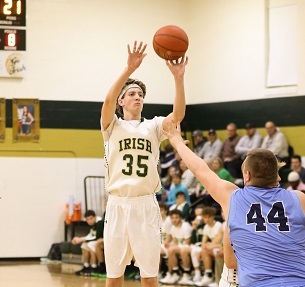 Zummo, a senior, was not only a deadly shooter, but also a standout rebounder for the Fighting Irish who made it back to the state tournament once again and managed to earn First Team honors after averaging 21 points, nine rebounds and four assists per game. West made his first years a memorable one as a standout on both ends of the floor for the 21-5 Notre Dame squad. He averaged 15 points, five rebounds and four assists per game. The Hawks, who had a solid season before being knocked out in the postseason by state tournament qualifying Trinity Christian, got big numbers from Jenkins and Barnette. Both seniors, the pair played a big part in South Harrison finishing the year with an impressive 17-6 record. Jenkins netted 22.3 points per game and 7.3 assists, while Barnette averaged 21 points a game and pulled down 12.2 rebounds per night. Editor's Note: Pictured is Notre Dame's Gabe Zummo, left, and Jaidyn West. Photos by www.benqueenphotography.com.